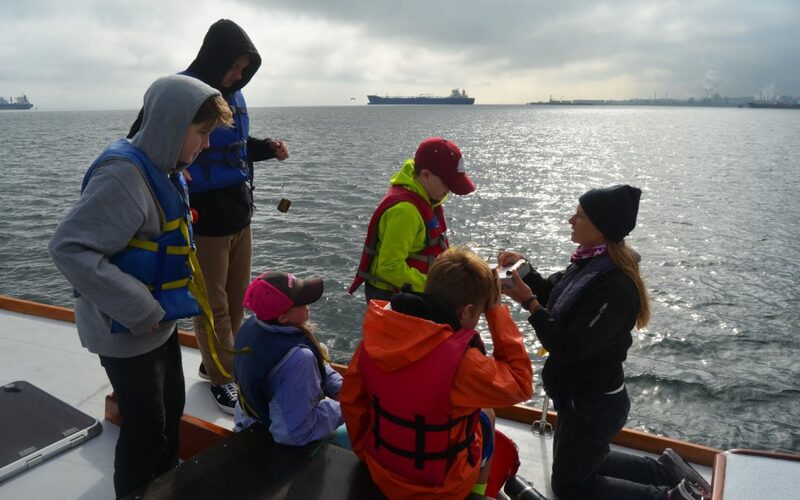 On September 26 and 27, 5th- and 6th-grade students engaged in a Salish Sea Learning Expedition funded as an off-cycle grant from the Schools Foundation. During the Salish Sea Expeditions students engaged in hand-on activities aboard the 61’ Research Vessel Carlyn exploring the Puget Sound ecosystem, water quality issues, and nautical science. 1. A Nutrient Station – Samples were drawn from the bow of the boat are analyzed using a colorimeter and compared to water from a local storm drain. 2. Dissolved Oxygen, Temperature, Salinity and pH Station – Surface and 20m samples were taken with a niskin bottle are analyzed using oceanographic equipment. 3. A Microplastic + Plankton Station – Samples were drawn using the Neuston net and then observed under microscopes in our onboard lab. 4. Navigation and Nautical Science Station – Students charted basic latitude and longitude, plus learn the physics of sailing and lift. In addition to the boat based experience – Salish Sea Expedition staff came to the classrooms to engage in pre- and post- expedition presentations to help prepare students, as well as debrief the experience and explore ways that students can use their learning for the common good of their community. 7/8-grade Marine Science Class will be “mentoring” 5th and 6th grade science students through monthly meetings, extending the learning from the initial expedition. Lori O’Brien and Rick Baker will help students to “localize” the water testing protocols learned aboard the Carlyn at a testing site they will establish at the Langley Marina. This testing data will be shared with City of Langley / Citizens of Langley through presentations and written materials students will provide. 5th/6th Grade students will use the information / learning they engage in on the Carlyn to support their salmon studies during the course of the year. If this is a grant that you would like to adopt for the future, please contact Board Member Chris Gibson at SWSF@whidbey.com. If you support student learning activities such as this one of the Salish Sea and the health of Puget Sound, we invite you to make a donation using the donate button.